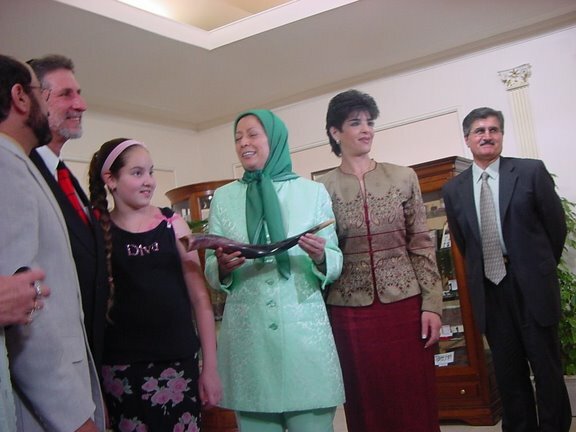 a few days ago , on 6 of July 2012 , an article written by MRS. Jolie Jowwarrick Tate was published in the honorable and popular Washington Post newspaper which was reflecting the realities of the Rajavi’s terroristic cult . The Yarran Association which all its members are the separated members of this dangerous terroristic cult , would like to support and confirm all the realities written in this article which are part of the realities existing in this dangerous cult , and also we would like to take this opportunity to thank and appreciate Mrs. Jolie Jowwarrick Tate for writing such a documentary and real article about the Rajavi’s terroristic-religious cult . we hope that in the near future we will be witnessing more revealing and enlightened articles about the internal cultic affairs of this dangerous and horrible cult and its leaders written by your honorable and distinguished authors . Honorable chief executive officer and chairman of the Washington Post company, we are all the former members of this cult and we had been living and working with this cult in Iraq for decades and we have closely experienced and witnessed the crimes against humanity by our own flesh and bones, against Iranian people, Iraqi people and us as the former members of this cult , perpetrated , organized and masterminded by the leaders of this cult specifically Massoud Rajavi. We are capable of sharing with you our experiences in revealing hundreds of facts and realities which substantiate and prove the violation and the breach of the preliminary and fundamental human rights in this cult . 1. 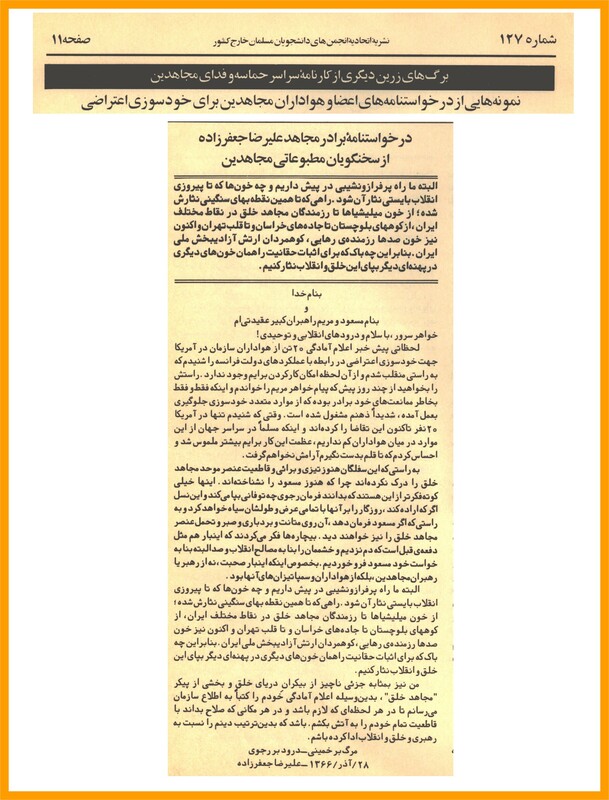 This terrorist cult can not distance itself from the violence and violent deeds because of its cultic essence ,and even now that they have set aside their arms forcibly ,they celebrate and commemorate the anniversary of their terrorist and violent deeds in the past which for instance we had witnessed their celebration and commemoration on 23th of June , 2012 in Paris. 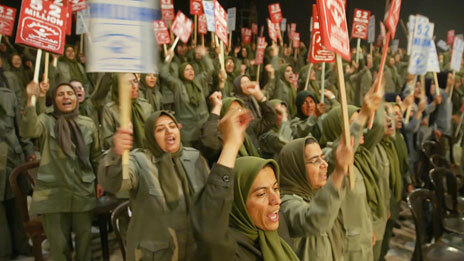 They resorted in the past and will resort to the violence and hooliganism and insurgency which for instance we witnessed on 22th of June 2012 in Paris which the hoodlums of Rajavi’s cult attacked and assaulted the peaceful and lawful demonstration and the rally of the dissidents and the critics of this cult in Paris which was directly ordered and masterminded by Maryam Rajavi from her headquarter in Auvers Sur Oise. They force and provoke their members to throw rocks against the Iraqi forces in Ashraf to provoke them to respond violently . all these facts reflects this undeniable reality that this cult with its leaders whenever they gain and obtain the arms , they will begin their terroristic deeds and operations and there is no doubt about that. 2. 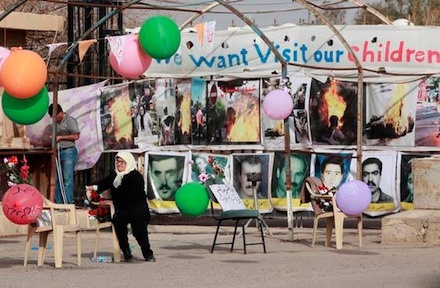 The leaders of this cult forced their members to carry out the compulsory and forcible divorce , so the Ashraf camp is the only place in the world that the marriage is prohibited and forbidden utterly in there. 3. The destruction and annihilation of the humane sentiments for the loved ones and the members of families , as a result of this fact , in this cult no one has a right to get in touch with his or her families and loved ones , and for this reason since three years ago the families of those stranded and stuck members of this cult in Ashraf camp , behind the gates of this notorious garrison, have had a sit -in to have a chance may be to see their loved ones but the reality is worse than it seems , the leaders of this cult have obstructed and blocked the meetings between the families and stranded members so far. 4. 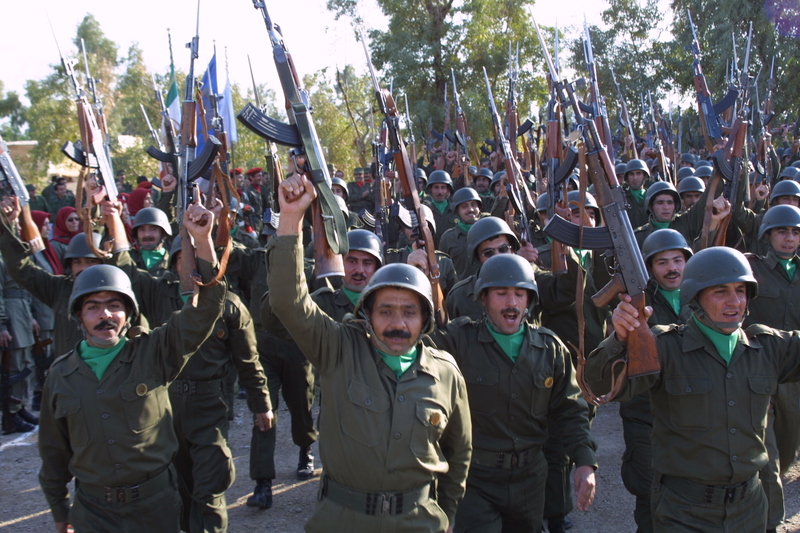 This cult under the title of the national liberation army (NLA) , has deceived the people under the age of 18 and has brought them to Iraq by varieties of excuses and pretexts and has taught them the military skills and trainings and has used them in war which is the breach of the human rights. 5. Building and establishing the prison and torture against the dissidents of this cult inside the organization like the imprisonment and tortures of the dissidents in 1994. 6. Creating and begetting the censorship and severe political strangulation and suppression inside the organization where the members even have no right to have a personal radio . 7. Forcibly separating the small kids from their parents and sending them to European countries in 1989 and straying them in those countries. 8. 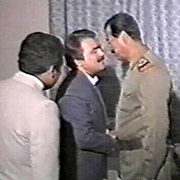 Participating in killing and suppression of the Kurds in the north of Iraq and Shies in the south during the Saddam Hussein’s dictatorship, in full military and intelligence cooperation with him. 9. 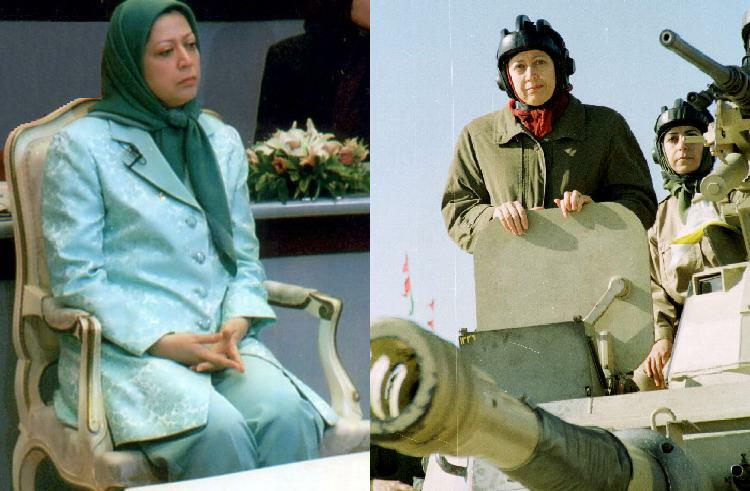 Participating in Iraq-Iran war against the Iranian people and killing the innocent Iranian soldiers in the borders of Iran-Iraq who were defending their soil against the Iraqi army offence. 10. The money laundering and extortion from the western countries’ people with fraud under the title of¨ Financial-Social and Special Financial ¨ ….etc ,and about this topic we can also submit hundreds facts. Honorable Mr. Donald E. Graham , the members of the Yarran Association are able to submit hundreds facts about the topics which mentioned above but because writing all those facts in just one letter is impossible consequently we would like to announce that we are ready to share and submit our facts and experiences regarding this dangerous terrorist cult with you wherever and whenever is possible and suitable for you .